In 2010, Hope For The Warriors® established their annual Gala to commemorate our combat wounded service members, veterans, their families, and the families of the fallen. This Gala was to focus on the hope these men and women inspire through their remarkable stories of recovery and achievement. Now, in our seventh annual Got Heart Give Hope® Gala and The Vigiano Family Hope & Courage Awards, we continue the tradition of honoring outstanding examples of selfless acts of service. 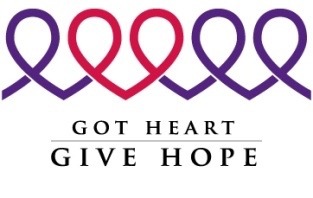 That same inaugural year, STUDIOetc generously donated their time to create the beautiful Got Heart Give Hope® logo. STUDIOetc brilliantly illustrates the Hope For The Warriors mission and depicts our dedication to the individual, the family, and the community – also portraying Purple Heart recipients and wounded service members. It incorporates the ribbon, a traditional symbol of support, and the heart, which evokes the Got Heart Give Hope theme for the evening. Since 2010, the Vigiano Family Hope & Courage Awards have been presented to service members and military families who have demonstrated both hope and courage in the face of extraordinary circumstances. Each honoree is an outstanding example of service to our nation. On September 11, 2014, Hope For The Warriors announced that the award would be named in honor of a very special family. Captain John Vigiano, Sr. retired FDNY, and his wife Jan, gave both of their sons on 9/11-one who served as a fire fighter and the other as a police officer in New York City. The Vigiano family has long served their country and their community. John served five years in the Marine Corps and then 36 years in the FDNY, becoming one of the most highly decorated fire fighters in NYC. After the tragedy of 9/11, the family continues to serve by supporting service members and military families. John visited troops in Iraq to personally thank them for their courage and sat at their bedside in medical centers to encourage their recovery. John joined Hope For The Warriors as an Honorary Board Member in 2006 and Jan continues to shine with strength and wisdom for her family. Over the years there have been many Vigiano Family Hope & Courage Award recipients, to learn more about them and their stories visit our Award Honorees page. John Phelps, professional sculptor from Dubois, WY and father of LCpl Chance Phelps, USMC KIA, Iraq, created these awards for the Got Heart, Give Hope Gala. John Phelps is a longtime supporter of Hope For The Warriors, an Ambassador of Hope for the organization, and works within the Outdoor Adventures Program. We would like to thank John Phelps for his dedication and eager willingness to support Hope For The Warriors. For more information about John Phelps, visit www.johnphelps.com. The art therapy session at the Caregiver Workshop encouraged me to focus on being good enough, not perfect, for my kids, my husband—and myself. That’s a huge stress reliever! Going to all three workshops helped me reinforce the habit of taking care of myself and sharing what I’ve learned with other caregivers.